Highend — The Ultimate WordPress Theme allows you to build stunning websites without any coding skills. It comes with Drag & Drop editor which makes website building so much easier and faster. Highend is 100% responsive theme, which means websites built with Highend theme will look amazing on any device, from mobile phones to tablets, laptops and large desktop screens. Highend is a multi-purpose theme, so you can use it to build any kind of website. Business websites, corporate, portfolios, galleries, online shops, blogs, online resumes and any other kind of website is possible with Highend theme. With over 30,000 users, Highend is the most popular and the best selling WordPress theme on MOJO Marketplace, and for a reason! Save over $150 in Premium WordPress Plugins – Included for free! 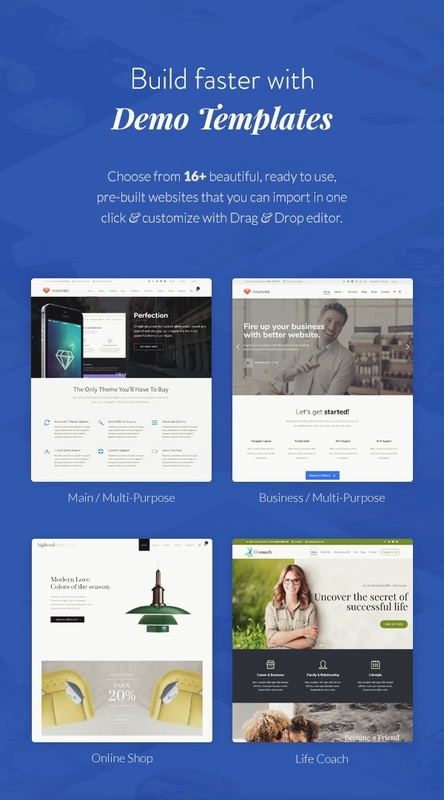 Visual Composer – Drag & Drop Page Builder. Comes with 14+ Pre-Designed Demo Websites. See demos.